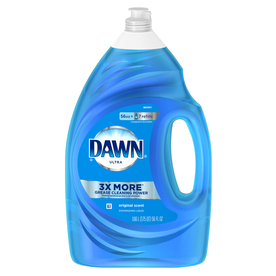 The Dawn Ultra Concentrated Dishwashing Liquid has the power you need to fight tough grease and get the squeaky-clean dishes you're looking for. This dishwasher detergent is 2x concentrated and has extra 30% cleaning ingredients per drop, so it cleans more with less. It rinses well with water and leaves no soapy or greasy feel on the surface of the utensils.